Sunflowers don’t immediately strike me as city flowers. Don’t they seem like they’d be happier out in a field somewhere? 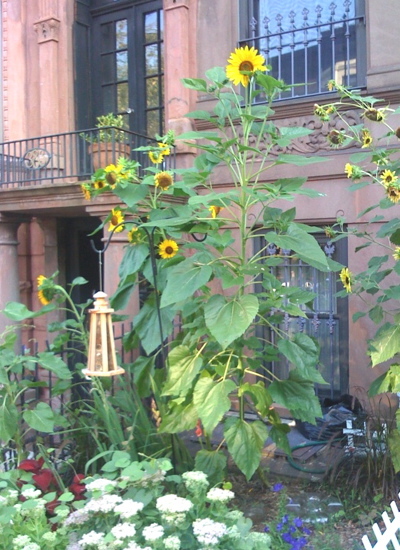 And yet, check out this Brooklyn brownstone stoop garden. These sunflowers look amazing there — a little bit country, a little bit rock ‘n roll with some bohemian thrown in for good measure. The yellow and brown bring great contrast against the worn brownstone red. Many people plant dark maroon foliage to match the brownstone, but where’s the contrast and the joy? These sunflowers stretch up to the parlor floor, bringing the viewers eye up to the front of the house. And the sedum Autumn Joy looks great at the foot of the sunflowers where things could be a bit leggy-ugly. I wonder if sunflowers could grow this tall on a roof garden. Would they snap in the wind? If you’re a first time roof gardener like me, I recommend trying some sedum. Sedum, also called stonecrop and sometimes mis-spelled as “sedom”, is a succulent — a chubby look plant that stores up water and can grow in hot spots with poor soil. You can see my sedum in the front left of this picture. Sedums are great New York City plants because they don’t mind the intense heat. 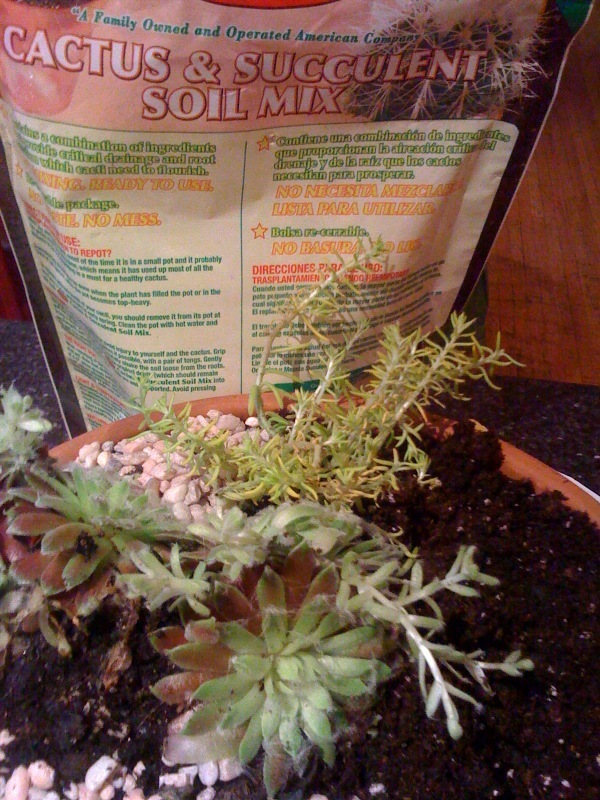 Most sedum should be able to manage a cold winter, stored right on the roof, and then come back strong in the spring. White Flower Farm and Blue Stone Perennials sell a bunch of different sedums. I’m considering buying another one. Next year, I’d love to grow a mixed succulent container like this one. Its looking like at least three more rainy days this week, so we’re going to either bring the sedum inside or find a way to cover them. Plant umbrellas perhaps? I’m considering re-potting our sedums in a different soil mix — with some sand and gravel — to create the dry well drained soil they enjoy. How long has it been raining for now? A week? A month? Looks like more rain is coming our way this weekend and into next week. Enough already. I’m not sure how much more of it our fledgling plants can take. While the herbs and the beach grass don’t seen to mind the stormy weather, the sedum is jumping out of its pot trying to out run the rain. How’s your garden holding up? Should we bring some of our containers inside to dry off? 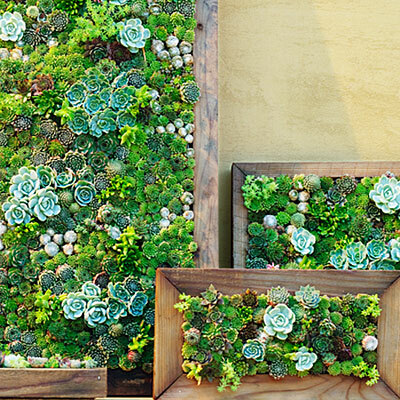 This San Francisco roof garden was built with the Woolly Meadow. We haven’t tested Woolly Pockets (or even seen one of these in person yet), but they seem to fill a great roof gardening niche: they’re pretty affordable ($247, hey… one plastic pot at Home Depot is twenty bucks! ), lined to protect the roof, and fold-able for winter storage. The containers is light, but be sure your roof can support the weight of soil + plants + water + the Woolly. Starting out with this $45 Woolly Patch might be the way to go … and I love this sedum. So far the green and yellow sedum has been our best plant, so we’re adding another one here. The contrast between the greeny-purple of the sedum and the purply-green of the tall Red Star makes this our most coordinated pot yet. There’s room for another plant in this post. Any suggestions? We apartment people don’t have garages, so this pot is hanging out in our kitchen today, waiting for drier sedum friendly weather to head to the roof garden. Does anyone know the name, botanic or otherwise, of this particular sedum? The couple who sold this to me at the Greenmarket didn’t know the name.